If you’ve been dreaming about planning a Maldives honeymoon or a Maldives vacation, I don’t blame you—it is truly an other-worldly paradise, with sugar-fine sand, crystal clear water, and villas with views to-die-for. I fell so in love after my own Maldives honeymoon two years ago, I’ve been back twice since, and I’m excited to share EVERYTHING I’ve learned with you. 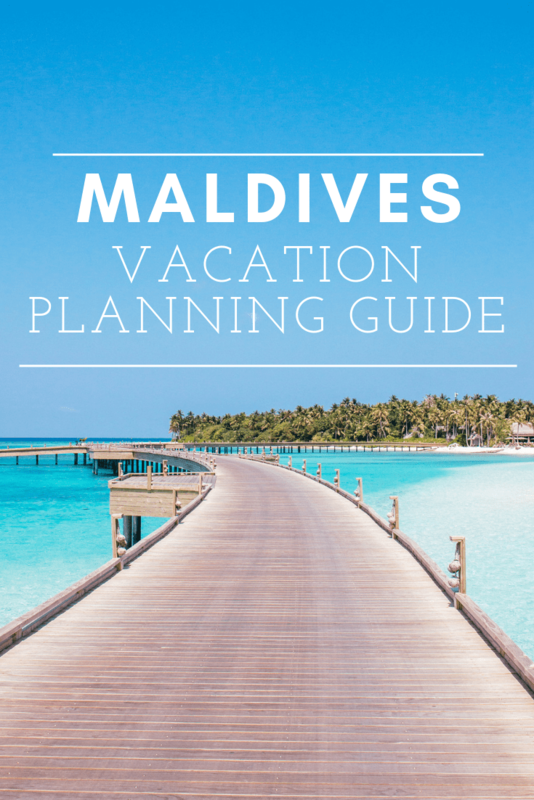 Here’s the thing about planning a Maldives vacation though: it can be VERY overwhelming if you’ve never been before. Every resort looks better than the next, so it’s hard to differentiate and make a decision about where to stay. And then there’s the fact that everything seems insanely expensive, so if you’re going to be splurging on a once-in-a-lifetime trip, you want to make sure you’re getting the best value, right? 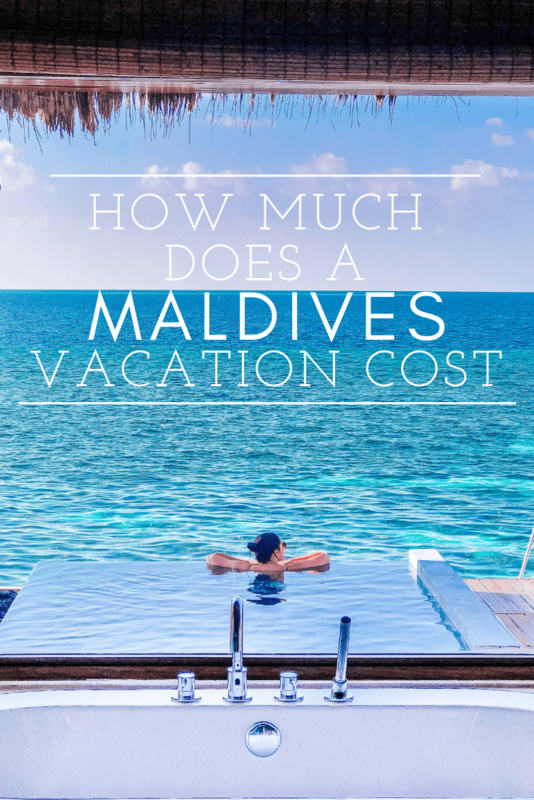 How much does a Maldives vacation cost? 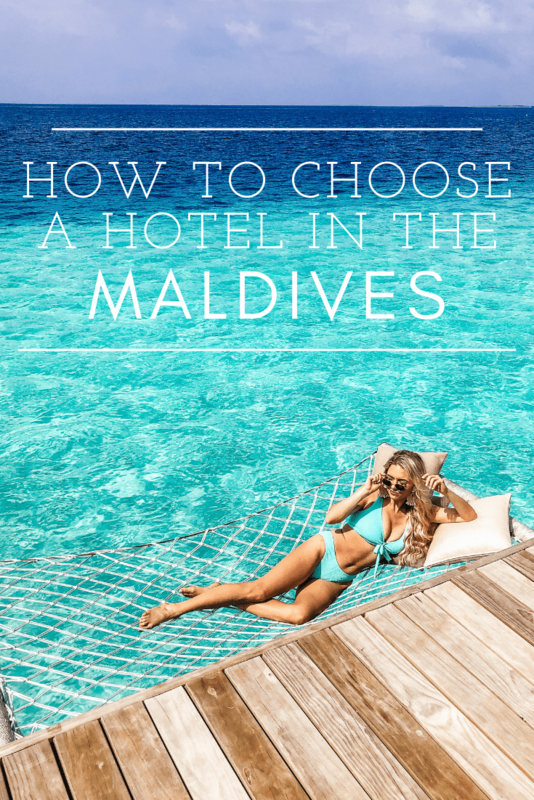 How do you choose a hotel in the Maldives? 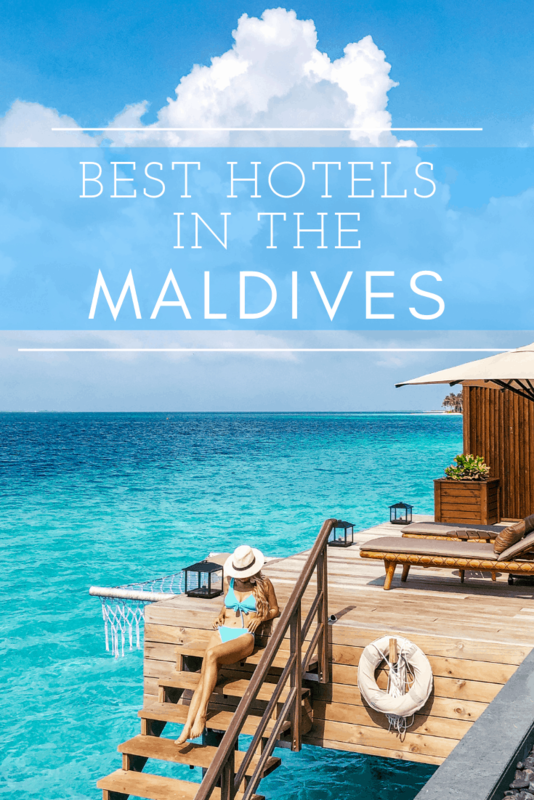 What are the best hotels in the Maldives? 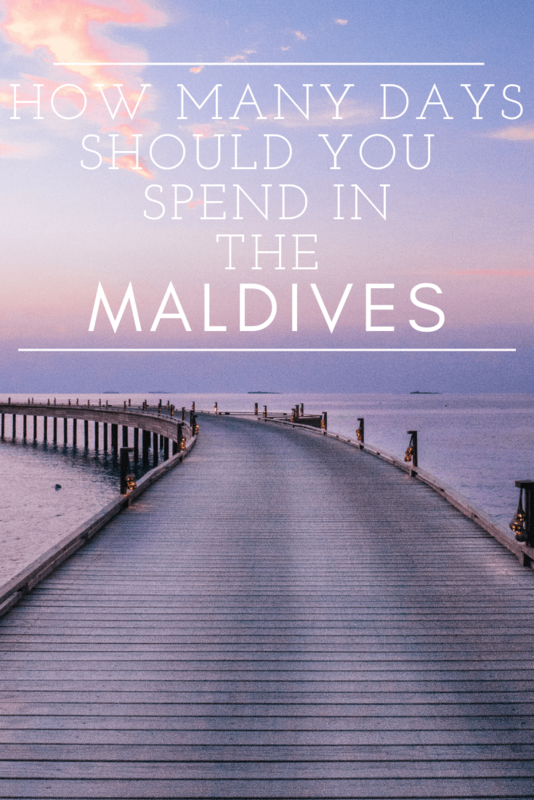 Is it possible to do the Maldives on a budget? 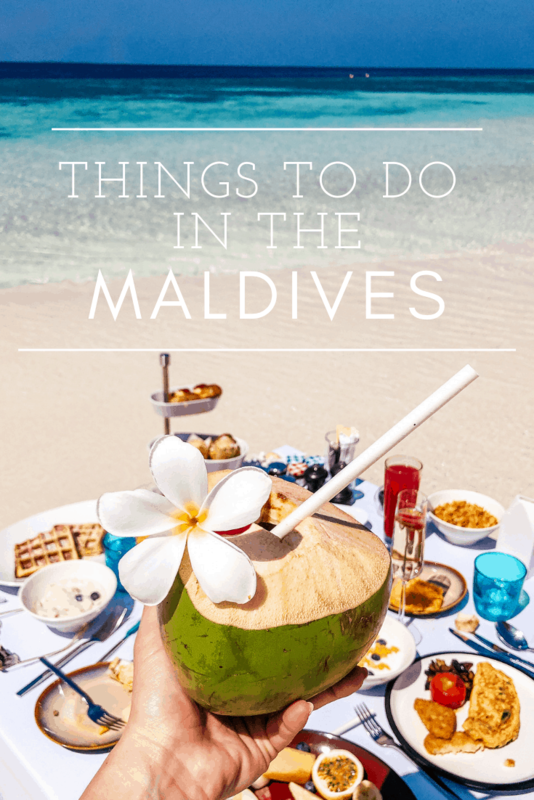 Are there actually things to do in the Maldives? Is it boring? How many days in the Maldives is the right amount? 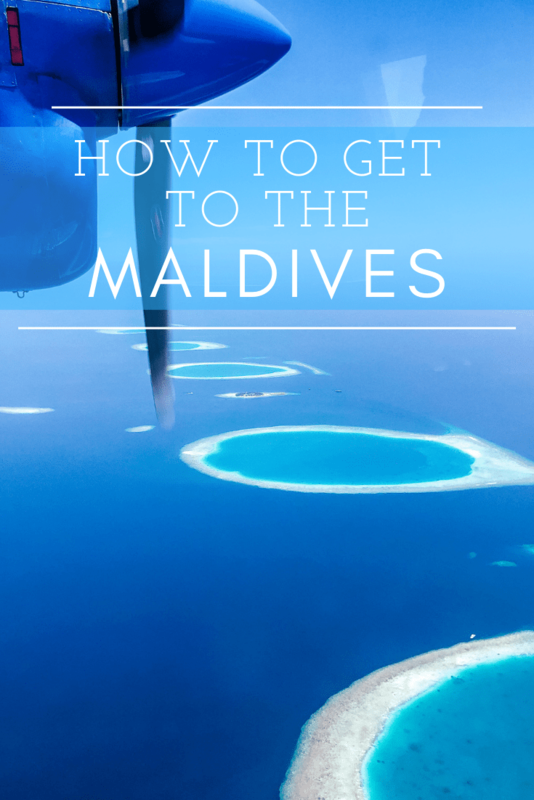 How do you get to the Maldives from the US? That being said, if you’re willing to take your chances and are on a tight budget, you can get some pretty incredible deals during low season. 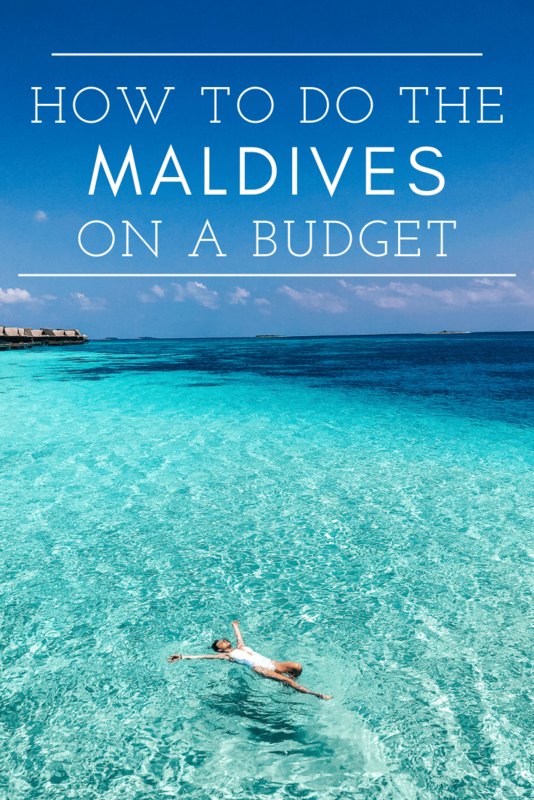 More on that in the “Maldives on a budget” section! I’m not going to sugarcoat it—the Maldives are very expensive. By and large, it is considered a “luxury” destination dominated by five-star hotels, and the prices reflect that. When you consider how remote the islands are, and how costly it is for hotels to source and transport everything, it’s no surprise that you’re going to be paying a premium. For most resorts, you should expect a minimum of $600/night, and many top-rated hotels will be much higher than that. Still, there are ways to get discounted room rates—by using points, taking advantage of packages, or finding off-season deals—which I’ll get into a bit later. One thing to keep in mind is that the food at most resorts is also pricey, and since each resort is on its own island, your options are limited to the restaurants on-property. Almost all of the hotels I’ve stayed at include breakfast in the rate, and some have the option for “half board” (breakfast, dinner and non-alcoholic drinks included) and “full board” (all meals and non-alcoholic drinks). Before pulling the trigger on a meal plan, look into menu prices at your hotel and crunch the numbers to see if a package makes more sense than going a la carte. 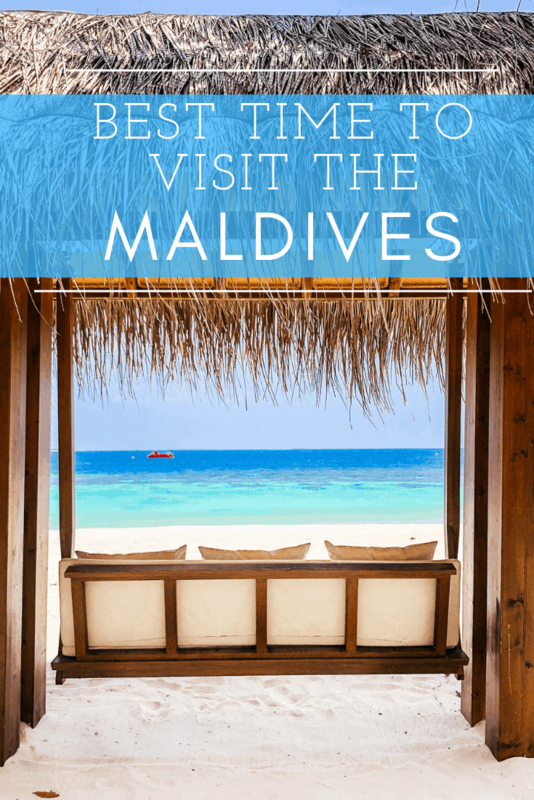 There are a few important things to understand about the Maldives before you choose where to stay, all of which I didn’t realize until I was planning my first trip. Each resort is on its own private island. Except for a few rare instances, it’s not possible to hop from one island to another since they are so spread out. Be prepared to stay put for the duration of your trip, unless you decide to switch hotels. Plane transfer hotels are further away, very remote, and require a seaplane or domestic flight transfer. These properties are truly “in the middle of nowhere” and are considered by some to be more exclusive, but they are also more difficult and pricey to get to. Seaplanes (also arranged via your hotel) only fly during daylight hours, from 6am – 6pm, so keep that in mind when booking your flights into Male (the capital city where the airport is located.) For ex: if I were staying at the St. Regis and my flight into Male landed at 10pm, I would have to spend the night at an airport hotel and wait to take the first seaplane the next morning. Beach villas are (obviously) on the beach. They tend to be slightly less expensive than overwater villas and are definitely a better option for anyone traveling with young children. PRO TIP: I often recommend booking an overwater villa for two nights so that you’re able to get the experience, and then switching to a beach villa for the rest of your trip (or vice versa.) That way you’re able to get two different experiences, and save (a little) money in the process. Highlights: Baros was one of the very first luxury hotels to open in the Maldives more than three decades ago, and it has since amassed a loyal following of guests who return year after year. The island is small, easy to navigate, and feels like “home” almost immediately. Unlike some of the other resorts, there are no bikes, golf carts, or motorized water sports—which is all part of the hotel’s effort to keep the experience as peaceful as possible. It is just a 20 minute boat transfer from the main airport, making it super convenient—and the hotel’s speedboat will pick you up the second you land, so there’s no time wasted. Baros Maldives, which is located just 20 minutes from the airport. Highlights: The set-up of Niyama is extremely unique—the resort is split between two islands called “Play” (family-friendly) and “Chill” (for adults). The property feels much more expansive than some of the others I stayed at, and has a lot to offer—from surfing lessons and a surf shack, to an underwater restaurant and nightclub, as well as a 24 hour spa. Highlights: I stayed in a luxury overwater villa during my visit to Joali, and I can confidently say it was the nicest hotel room I have ever experienced. (Considering I write about luxury hotels for a living, that should tell you a lot.) The attention to detail at Joali is on another level, and the entire resort is jaw-droppingly beautiful. From the staff (each room has its own butler) to the meals, it was a 10/10 all around. We even noticed an A-list celebrity couple sitting next to us at breakfast, which is indicative of the clientele Joali attracts. Highlights: I’ve stayed at the St. Regis twice, and it was consistently incredible across the board. Each room has a dedicated butler that will do EVERYTHING for you—pack, unpack, press your clothes, pick up your snorkeling equipment—you name it, they’ll gladly get it done within minutes. One of my favorite things about the St. Regis, beyond the spacious rooms, is the fact that all the guests convene each evening for sunset at Whale Bar. It’s a sprawling outdoor deck with the most insane vantage point, and live music every night. Also: the breakfast spread is among the most impressive I’ve ever seen. Highlights: Unlike some of the other resorts, where you could go for an entire day without seeing another guest, the W has a more lively vibe. Breakfast is bustling (the buffet is incredible); there’s a DJ by the pool every afternoon and also during the evenings at Sip Bar for sunset. Villas don’t have dedicated butlers, but the staff is fantastic and eager to bend over backwards for any request. 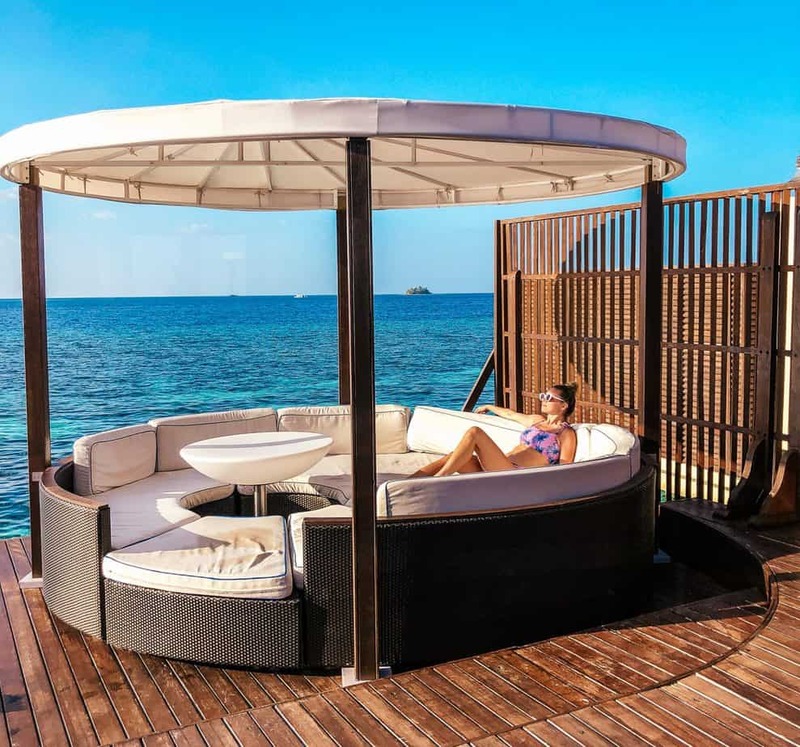 Overwater villas at The W Retreat have oversize sunbeds for lounging. The property recently suffered damage due to a fire so it is currently under construction, but it is one of the most unique and special places I’ve ever stayed. I’ll update this post with details when the property re-opens. HOW MANY DAYS DO YOU NEED IN THE MALDIVES? This really depends on your budget and your travel schedule (i.e. will you be stopping anywhere else before or after the Maldives?) I’d say anywhere between 5 and 8 nights is a sweet spot, depending on how far you’re coming from. For an 8-night trip, I’d recommend switching hotels halfway through for a change of scenery. To be completely frank—the Maldives (unfortunately) is not a place that caters to budget-conscious travelers. That’s not to say it can’t be done. Here are a few ways to shave hundreds of dollars off of your trip. These deals can take a little digging to track down online, so I often recommend using an in-the-know travel agent to assist in your booking. Pay with Credit Card Points. Many credit cards offer a generous sign-up bonus of anywhere from 50,000 to 75,000 points just for opening the card once you hit the minimum spend. (I have a list of my favorite credit cards for points travel here.) When Matt & I went on our honeymoon, we both opened a Chase Sapphire about a year prior—between the sign-up bonuses and our wedding expenses, we were able to pool enough points to fly first class round-trip for free. Had we used our points on hotels instead, we would have had enough points for free nights at many of the hotels listed above. I explained this earlier, but ICYMI: each resort is located on its own private island, which means you will basically stay put at the resort for the entire duration of your trip. This might be a turn-off for anyone who gets antsy during beach vacations, as there is no city to explore or activities beyond what’s available at the resort. But what I will say is that in my experience, I’ve never felt even remotely “bored”—and I’m the kind of person who likes big cities as much as beaches. Maldives hotels are used to having guests stay for a week at a time, and most of them have plenty of things on offer—yoga classes, movie nights, water sports (kayaks, jet skis, paddle boards, kite surfing, diving, snorkeling), cocktail-making classes, wine tastings, spa facilities, sunset cruises, dolphin watching, surf expeditions, etc. While some hotels include non-motorized water sports complimentary, be prepared to pay additional for other activities. HOW DO YOU GET TO THE MALDIVES FROM THE U.S.? Speaking of flights, if the idea of 25+ hours of travel freaks you out, be sure to read my blog post about How to Survive a Long Haul Flight Like a Pro. If you’re still reading at this point, God bless. I hope you found this helpful! Please feel free to leave questions or comments below—I’m happy to answer more specific questions about the hotels I experienced. And, as always, you can slide into my DMs on Instagram whenever. Thank you for sharing budget ideas! I’m a big points hacker, too, but still want to start on the lower end for cost. Honestly I think the Park Hyatt Points deal (30k a night) is a steal! So happy to hear that!! Always open to specific questions, let me know if you need help! Yay!! So glad you found it helpful! Thanks for sharing! I really enjoyed reading your experiences. Dude, this is amazing. This is such a well-curated/researched post, saving and plan to use later! This makes me want to go the Maldives even more than I already wanted! The price info was really helpful, so thank you!! Yes, totally agree! That’s super important to note. I remember before I went for my first time someone told me to be prepared to spend “$30 on a caesar salad.” He wasn’t exaggerating. Great point! Planning to go with husband and three adult children and their SO. So that’s four couples. Any ideas if any hotels have large family villas? Or maybe two larger villas that have two bedrooms (so four bedrooms total). We like each our own privacy for sleeping – ie no cots or couch sleepers) but some togetherness during the day.